The next time you’re thinking about how hard it is to get up and go to class or work, consider Pensacola State nursing student Natasha Suggs. The Century resident has made an hour-long commute to classes for the past five years. “I didn’t have a car for the first couple of years. I was here doing my pre-reqs, so I used the bus system. There was one running from Century all the way here, so that turned out to be very beneficial,” said Suggs, who chose a career in healthcare after her grandfather was diagnosed with Alzheimer’s disease. After graduating high school with her Certified Nursing Assistant (CNA) certification, Suggs went to work in a nursing home. “I think that was a real big part of the healing process, because I was kind of angry… I didn’t get a chance to help him. But being the youngest employee at a nursing home, you’re kind of like the grandkid that comes to visit, so I got a facility full of grandparents,” she remembered. As a CNA, Suggs provided basic care for patients ─ assisting them with daily activities like eating, bathing and getting dressed. She considered majoring in physical therapy, but admitted she wasn’t “as excited about toes as I should be.” Working alongside the nursing staff, Suggs discovered she really admired the compassionate connection nurses had with patients. 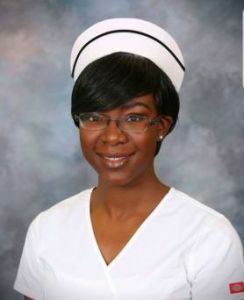 Suggs’ experiences in the nursing home fueled her desire for a healthcare career and in 2013, she began taking prerequisite classes at Pensacola State. She even enrolled in the college’s phlebotomy program so she could gain experience working in a hospital setting and received her certification in 2016. “I graduated from phlebotomy and I headed off to work in May. In August, I started the nursing program,” she said. Suggs also worked at Jay Hospital, which enabled her to jumpstart her funding for nursing classes, but it still didn’t provide enough to cover all of the expenses. Due to her family’s household income, she didn’t qualify for federal aid. However, the Pensacola State family came to her rescue. “For the longest time I thought, well, if you don’t get it from financial aid you’re kind of stuck,” said Suggs who added her Latin professor, Dr. Charles Schuler, helped her find alternate ways to find scholarships. Suggs also appreciated her advisors – noting many went above and beyond classroom teaching. She said her phlebotomy instructor, Wilma Duncans-Burnett, called her in February 2016 to make sure that she was OK after tornadoes swept through Century. Johnston continues to support on and keep Suggs on her toes. “Every time I see him he’s like, ‘What are your grades like? 4.0, Natasha? You can do it!’” she said. Suggs firmly believes Pensacola State was the right choice. She has high praise for the college, but her favorite spot on the Pensacola campus is The Drowsy Poet. “Those bacon, egg and cheese sandwiches… that’s what I lived on the first semester,” she said. “I really like the fact that all of the instructors really focus on that mantra. ‘We will equip you with what you need and where you go from there is up to you,’” said Suggs who will graduate on May 6 with her associate degree in nursing.